A part of the Hambach forest has been squatted in order to save it from the excavators send by the gigantic energy corporation RWE to dig up brown-coal. During a cultural festival in the woods, under the slogan “Forest not Coal”, activists pulled up platforms in the trees. At the festival people from different groups met up, forming a broad coalition to get active in saving the Hambach Forest and stopping the extraction as well as the combustion of the coal beneath it. According to the plans of RWE, the Hambach forest, near Cologne, shall be completly destroyed to make space for the largest open-cast mine in Europe in the next few years. During the festivity people got the chance of taking responsibility by godfathering their special tree and protecting it their way(s). First: The gap between what is legal and what is regarded as justified by us is too big. 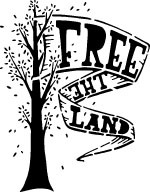 Even though RWE is, by destroying the forest in order to dig out the brown coal for burning it, also destroying the regional basis of living, as well as endangering peoples’ health in the area, not speaking of the worldclimate, they are legally allowed to do so. However we cannot find any „real“ justification for RWEs doing. By squatting this forest we’re not acting legal according to the current laws. But the squat is justified by the aim of trying to stop RWEs wood and world destruction course. Second: We believe that the gap between what is legal and what is just will always exist, due to the simple reason that a neutral point of view cannot exist. Just and legal remain different because everybody has a different definition in mind of what is just and what is not. Therefore establishing a free and lively discussion about what is just and reasonable, is a must; rather than having the definition derivated from ancient laws which, for the most, are only protecting the interests of the ruling elites. By squatting we’re trying to generate such a process of vivid negotiating, furthermore thematizing the topic of how climate and enviromental destruction shall be dealt with. Loudly we’re shouting „No!“ at anybody whom’s solution it is to go on just like used to be, AND who are -just like RWE- even speeding up in the old fashioned way by building new coal-fired power-stations. If we are to be evicted by police force then we are facing the answer of a repressive state which is tring to supress any horizontal and vivid process of self-organization. That is the ideolgy of the state, as well as of the capitalist cooperations, who are far too inflexible, not mentioning their wrong maxim of action, to give reasonable answers to the problems of our time. They will eventually perish just like the dinosaurs who were also unable to cope with the changing conditions. In fact the solution is not to modify the existing system of exploitation and opression into something more flexible, but to overcome that system! This squat is opposing coal energy in general as ist is the most CO2 intensive form of gaining energy. The „Rheinish brown-coal-region” is Europe’s climate killer no. 1. But we also stand in solidarity with communities in other parts of the world e.g. Columbia where the extraction coincedences with brutal human rigth violations. Worldwide the conflicts arising alongside coal extraction and burning are getting worse. Especially in Southeast Asia where in the last few years resisting activists have been murdered. We want to create awareness of these struggles to help the people fighting. Therefore we’ll include more informations about the on-goings in these areas in our further declarations, letting those acivists speak. 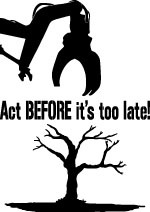 Furthermore we declare our solidarity towards the radical anti-coal-campaign like the coal-action-network in the U.K., rising-tide-groups in Australia and North-America, or the „wij stoppen steenkool“ campaign in the Netherlands. With their direct form of action, these groups gave an us inspiration, and we hope that these actions will inspire other groups world-wide as well. 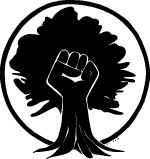 Squatting the forest shall be an act of re-empowerment by the locals. 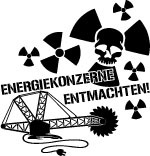 The „Occupiying Force“ RWE shall loose their „right“ of determining the future of the region, unscruplously destroying the local and global fundaments of live. People should decide of what will happen to the forest in a cooperative manner instead. This space should be open to all on the basis of equal treatment of each other. Therefore it is necessary that the people question the role-models and ways of acting they reproduce and how they perform acts of dominance or support them. We think that it is important that we all act together to fight, prevent and intervene disriminating acts of any kind. Squatting the Hambach Forest is an action directly confronting the injustice. But we want to go on further: It’ll also be a place for people of different backgrounds to meet up and network. People that used to have only the fight against brown coal in common shall come together exchanging ideas and experiences of the ongoing surpression. Through this exchange a network and organisation shall emerge – for the furthermore resistance, but also beyond that. We need spaces where people are able to plan how a climate-just future should and can look like. Firstly because the current politics totally failed and keep on failing in answering the pressing matter of climate change! Secondly because organizing ourselves from below is much more fun anyway! Maybe this squat might become such a place. The offshoot of a new world inmidst the heart of fossil-nuclear capitalism. Why „Declarations of the Hambach jungle? The name of this text came up following the tradition of the Zapatistas in Mexico and their „Declarations of the lacandon jungle“. The Zapatistas achieved their aim of living in dignity in the borders of the poorest Mexican state through a strong direct and determind push back of the repressive police and para-military of Mexico. We are not that bold of claiming our action to be comparable to the things happening in Mexico but nevertheless our aim is the same. 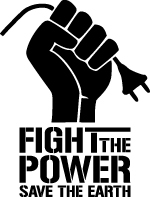 Fighting for a self- determinated life in dignity inmidst a system of destruction and opression. We believe that succesfull fights as in Chaipas all over the world are possible and necessary. We want to make the first steps in this direction. That form of a declaration was also chosen because we are tired of corrupting and shortening the contents only to make them fitting into a standard press format, whereafter they’re still totally corrupted by the press. Instead we’re optimistic that this and the following declarations will reach -hopefully many – people directly. We call that forest Hambach jungle knowing that this term is not correct. But the Hambach Jungle is, in its structure, one of the oldest forests in Western Europe. Rare habitats are found here. Unlike RWE, wanting to destroy the forest in total, we plead in favour of another solution, an experiment wherby that very natural forest will, in a few decades, turn into jungle-like wood. Then, we would leave the Hambach Jungle deliberatly!